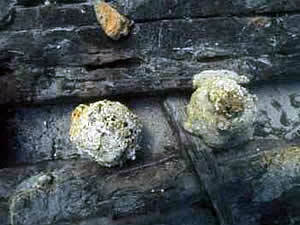 UnderwaterTimes.com | Study: Could Cannon Balls From The Early 19th Century Really Sink Warships? Study: Could Cannon Balls From The Early 19th Century Really Sink Warships? HAIFA, Israel -- A joint experiment carried out by researchers from the Leon Recanati Institute for Maritime Studies at the University of Haifa and staff of Rafael Advanced Defense Systems Ltd. has solved the riddle that has been puzzling researchers ever since they first observed the thick wooden sides of the sunken ship opposite the shore of Acre: could cannon fire have penetrated the hull? The ship was discovered in 1966, but only since University of Haifa researchers began examining it about three years ago have its mysteries been exposed. The initial matters of interest related to the ship's origins, date and the reason why it sank. A map drawn up by a British officer in 1799, during Napoleon's siege of Acre, led the researchers to assume that this was a blockship sunk by the British to bar French vessels from entering the port. 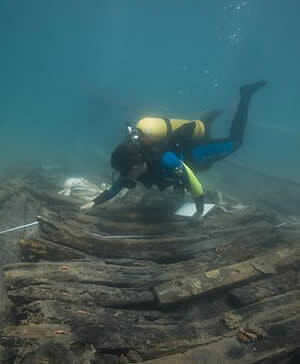 Another puzzle that has occupied the researchers, however, relates to the thickness of the ship's hull. According to Dr. Yaacov Kahanov, who heads the research team, it was evident at first glance that the hull, which was constructed of oak, was unusually thick, leading the team to question the possibility of cannon-ball penetration. Experimental firings of cannons at replicas of wooden warships have been carried out in other countries, but due to the cost and complexity of such experiments, they have been few and far between. In general, they were only firing demonstrations, and scientific data has not always been obtained. So it was still hard to tell for sure whether the cannon balls found in the wreck would have been capable of sinking this particular ship. The University of Haifa marine researchers received assistance from a team of Rafael engineers, who developed a unique model that enabled firing experiments to be carried out on a reduced scale, thereby reducing costs, and enabling controlled, measured and documented experimentation. The present experiment was carried out at a scale of 1:2, for which five models of the ship's hull, based on the archaeological findings, were constructed at the University. In parallel, Rafael adapted an experimental gun to fire steel balls, modeling the cannon balls. Meticulous measurements were taken to ensure setting the range of muzzle velocities of the period; 100-500 meters per second. The experiments showed in the most dramatic way that, despite the hull's strength, it could not withstand the impact of the cannon fire, which penetrated it even at the lowest velocities. It also became evident that the lower the velocity, the more energy was absorbed in causing damage to the hull, and the more the wood splintered, which would have caused more harm to the ship's personnel. The results of this experiment, according to the researchers, are of much significance to the study of the vessel and to the study of naval battles in this period. Very interesting. Would love to see the small models used.